As most horses are within 1 or 2 sizes to keep down the return postage costs for the fit kit hoof boot hire service instead of sending out all 10 x different Equine Fusion sizes available for the UK we will send out 3 x as per your chosen sizes required! 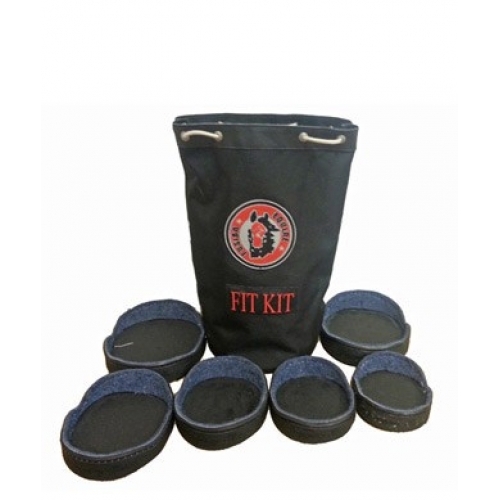 Your measurments will determine which size fit kit you need. For example, if your horse’s hoof measurements call for a size 12, order a 11, 12 and size 13 equine fusion shells. Please note you will be responsible for returning them to us at your cost, and we are not able to refund you until the kit is received by us so we do recommend a recorded method of postage. Equine Fusion fit kits that are returned to us with parts missing, broken or dirty will be refunded less the cost to put them right again. Postage to send the Equine Fusion Hoof Boot shells is non refundable. The Equine Fusion Fit Kit allows consumers to fit their horse's feet in the Equine Fusion Range of Hoof Boots before ordering, to ensure the best fit possible without the hassle and wasted time of buying and returning multiple boots. Pre-fitting in the shell will ensure a perfect fit in the Equine Fusion Range of hoof boot models and is especially helpful if your horse is between sizes or has one foot a slightly different size to the other. Equine Fusion Range of Hoof Boots are available in the following sizes - Please See Size Chart Below! Compare your measurement with the Equine Fusion size chart above. Please note our Equine Fusion size charts are in millimeters only. Your measurments will determine which size fit kit you need. For example, if your horse’s hoof measurements call for a size 12, order a 11, 12 and size 13 Equine Fusion shell. Keep in mind that most horses require larger boots on the front feet. You may need to order two Equine Fusion Fit Kits. One to accommodate front feet and one to accommodate the rear feet. The Equine Fusions due to the way the boots fasten can accomodate a complete range of hoof sizes compared to other hoof boots.